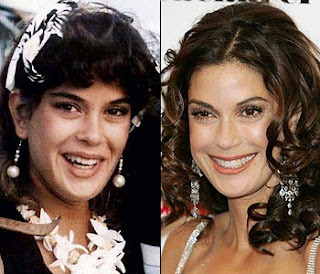 In part one of this series (Click here to go to Part 1) we looked at how a few celebrities looked in their younger years before they made it big. It was kind of inspiring since it was obvious that most were pretty average looking and evolved into the glitterazzi we all know and love today. This batch is no different except we threw in a few that were pretty bright eyed and fresh looking in their youth before being run over by the steamroller known as age. Once again it is inspiring to know that celebrities are just like us. Enjoy. Growing up in the 70s, who didn't want to be John Travolta? Growing up in the 2000's nobody wants to be John Travolta. Okay that was a bit harsh....... he's still cool and takes on pretty daring roles. Gotta love Barbarino. I'm still amazed she was actually a Bond girl. She's looking pretty thin lately - a bit too thin which tends to be a wee bit off putting but she still has her moments on Desperate Housewives where she's almost attractive.......almost. I'd say something bad about her except for two things - first, she kind of scares me and could probably take me in a fight (look at those biceps!) and secondly she's still freakin' awesome. Her body of work (and body) have pretty much spoken for themselves over the years but she could skip a few workouts and pop a couple of glazed donuts once in a while. Wow - what to say? George is the embodiment of every bad grade school picture ever taken but thankfully that picture provides hope for the countless size 8 bowl haircut wearing geeks everywhere - you too can grow up to look like George Clooney........though not likely.